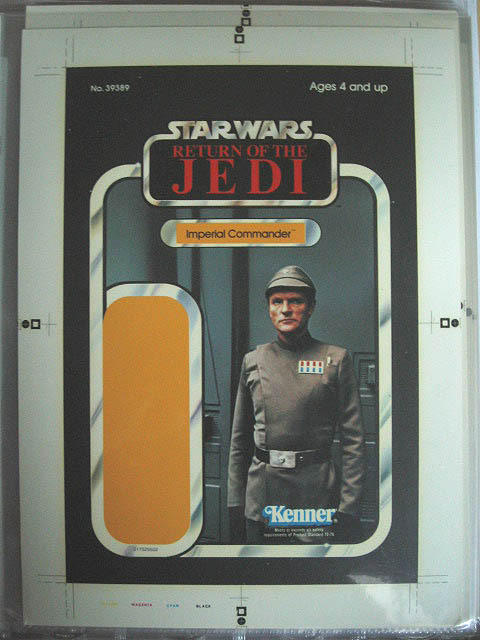 Featured here is a cromalin for the Return of the Jedi 3 3/4" Imperial Commander action figure packaging. Cromalins play an extremely important part in the creation of toy packaging. Notes are often found on cromalins to indicate changes that need to be made before the final version is approved. Suggested changes vary from piece to piece, but range from text absence, necessary color changes, etc. The picture clearly conveys the vivid colors exhibited on cromalins.